Last week, Jenkintown Public Works under the supervision of George Locke made an attempt to address an ongoing water drainage issue on Runnymede Avenue. According to the Borough, it seems that a spring somewhere between Hillside Avenue and the 200 block of Rodman gets expecially overactive after snowmelts and rainstorms and gushes water down the hill and into the yards of properties on the 200 block of Runnymede. In the winter, this is especially problematic since the water that pours into the street tends to freeze, creating a hazardous condition. Mr. Locke proposed expanding the capacity of the storm drains on the 200 block of Runnymede to handle the overflow. I’ll be the first to admit I’m not civil engineer, but it seems to me that it might make more sense to address the water at its source. That said, JPW dug into the street to lay pipe and to install new drains. 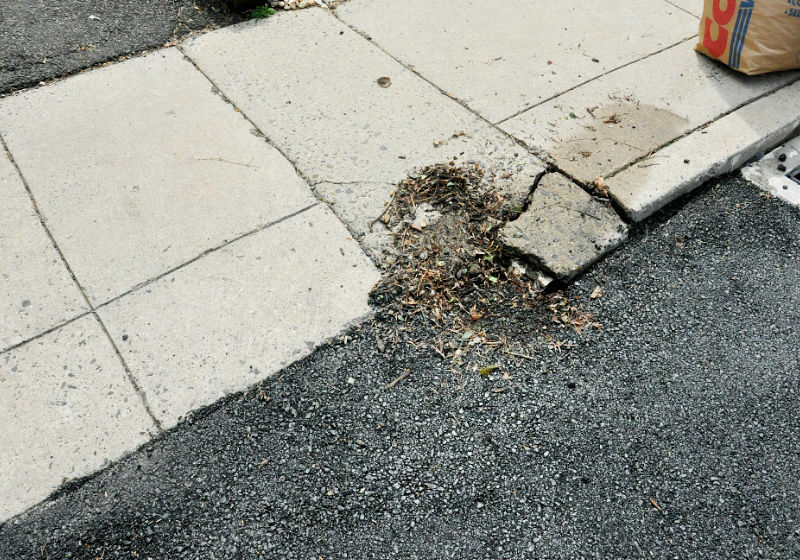 The work caused damage to existing and recently repaired sidewalks, aprons, and curbs — some of it severe. This section of Runnymede was repaved in 2015, and the patch applied promises to accelerate the eventual deterioration of the street. We’ve stated this on many occasions: For a town that prides itself on its walkability, it seems to actually care little about it. This is not workmanship worthy of such a town. For the record, George Locke earns a salary of more than $125,000/year plus benefits. This gallery shows some of that work. Apparently, work started on a new drain, but was then abandoned. Borough code calls fora 3-4 inch reveal. The borough doesn’t even abide by its own code. This shows the damage caused to this resident’s driveway apron. The borough also removed the required apron threshold and didn’t replace it. close-up of that severe damage also reveals a clogged drain. Water is still coming down the hill into another resident’s yard. The problem was not addressed at the source.